I went out and pinched of the buds and anything that didn't resemble a butternut squash. If I trim back some of the vines - the ones that are a bit too long, will that assist with it growing healthy fruit more easily? Yes. I would continue to pinch off any new blossoms or teeny fruit that appears. You really want to force the plant to focus all of its effort into the squash that's already there. But don't prune too heavily or you could force the plant into shock, so be thoughtful with pruning or pinching. And check for squash bugs everyday, picking and destroying them on site. If you spot any die-back at all, prune it off. 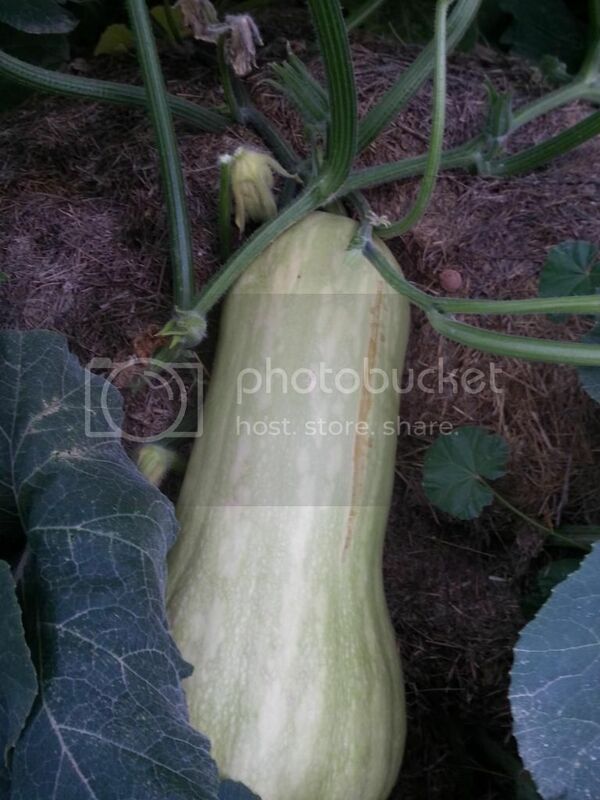 The longer you can keep that squash on the vine, the better the chances for it to ripen before you move. Heck...if your last day there is Sep 30th, I'd pick it right before I drove off . Good luck! Thanks. (Can't rep you anymore for a while). Same thing happened to me. Screening the compost didn't remove some of the pumpkin seeds so I ended up with hundreds of pumpkin plants wherever the compost was spread. We decided to let some of them grow wild to see what would happen. Too soon to tell if that was a good idea, but we have dozens of pumpkins growing in places all over the yard. They were GOURDS. Every single one a different shape and size. My windowsill was well-decorated that fall. It's gotten so big it's splitting, but it's not ripe yet. "The good news is that often the cracks in a split squash will heal over. The outside layer has a corky substance called 'suberin' which initially oozes out then sets or scabs. Suberin repels moisture and is there to stop water entering or leaving the inside tissues of the fruit. If bacteria have entered the split squash, nothing will save it and it will soon go rotten, so make sure the squash fruit are off the wet ground for a start." My biggest concern has always been squash beetles but I've never had a squash that split. I hope it heals over! Last edited by RVcook; 08-21-2014 at 11:52 PM.. I started a compost pile and was tending it well. Then ignored it for quite a while. I went out there and this huge plant had taken over. I think it butternut squash, but I'm not sure. What do you think? I'm in hardiness zone 6a. If it is butternut, which would be my preference, when do you think it will ripen. It's on the east side of my house, so it only gets morning sun. I've never timed it, so I don't know exactly how much that is. If I cut the leaves over the fruit, will they ripen faster? That sounds like my cantaloupe story last year and the year before: thank goodness this year didn't repeat. A couple of years ago, I didn't really do a compost pile, but I do throw some of the garbage, like peeling from the veggies, coffee grounds, etc on the garden just before we actually are ready for spring planting. Well, about Aug or so we noticed these round things growing everywhere, up the fence, along the edge of the wood dividers, wherever. I thought it was some kind of squash or maybe lemon cukes, something I had forgotten I had planted. Well, it turned out to be cantaloupe, we probably had 20 of them, none fit to eat. Along came July and Aug last year and again along came our friend, the cantaloupe. This time we did get a couple that were edible. I was so sure we would have a repeat this year, but we didn't. Since my experience with cantaloupe skins and seeds, I am a little more careful what I throw in my garbage pile for the garden. Your squash sure looks nice and yummy, split or not. Let us know how it tastes, the plant is beautiful. So was our cantaloupe plants. Our compost heap always ended up with pumpkin and watermelon vines growing from it. We just let them do their thing. Yum! Surprise food!